Home > Supplements Overview > How Can Chondroitin Help my Joints? Glucosamine has carried a well-enjoyed reputation as the most popular joint supplement in treating ailments such as osteoarthritis. Either on its own or combined with the supplement chondroitin, it has seen widespread benefit. Both are molecules which help make up joint cartilage; while glucosamine helps repair cartilage, chondroitin is responsible, at least in part, for its resiliency. Chondroitin is a molecule present in the human body, one that is a major part of cartilage, which helps cushion the joints. As we grow older the cartilage we have suffers a great deal of wear and tear, and we get resulting complaints such as osteoarthritis. Chondroitin is essential in keeping joints healthy as it absorbs fluids in the connective tissue. It is thought that is possibly blocks enzymes which break down cartilage as well, and also helps provide building blocks that the body needs to produce new cartilage. As such, health supplements containing chondroitin are thought to help treat osteoarthritis (OA), and perhaps even block the progression of the disease. It has also been linked with helping block joint pain in people suffering from OA – some studies have shown that it is as useful as painkillers such as paracetomol or ibuprofen. Can Chondroitin Be Used to Treat Other Ailments? Yes, It is used to treat dry eyes, bladder pain and lower jaw pain. In fact, special health supplements containing chondroitin are also available in chewable tablets for dogs who have the canine form of OA! It is important that you know exactly from where the chondroitin you are buying is sourced. Chondroitin joint supplements on the market today are primarily sourced from one of two sources: shark cartilage and cow trachea. The latter has spurred concern of possibly spreading the human form of bovine spongiform encephalopathy (BSE), or mad cow diseases, although that danger is exceedingly remote, if not impossible. Mainly, it's used as way for manufacturers of chondroitin sourced from sharks to advertise their products! Make sure you only purchase chondroitin from a reputable manufacturer, and always be aware that a doctor should be consulted before taking any health supplement except for multi-vitamins and minerals. 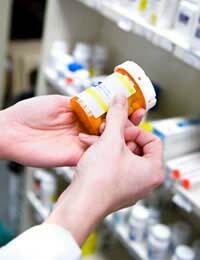 Some can interfere with each other, or with prescribed medications. Chondroitin is quite safe if taken only in the recommended dosage. However, it is known to increase the risk of bleeding, so people taking any blood-thinning medicines should consult their doctor first before taking this health supplement. It has also been known to cause tummy upsets. Be aware that it may be necessary to take chondroitin for up to six weeks before any benefit is seen. Always follow the recommended dosage. Obviously costs vary, but while chondroitin is not available on prescription a month's supply should cost about £10 - $15, perhaps in a combination formula with glucosamine. Your GP should be able to reimburse this cost as the Prescription Prescribing Authority will reimburse them. As a dietary supplement chondroitin is still classified as a supplement rather than a drug, which means its manufacture does not have to undergo the same rigorous testing that drugs do. Only purchase it from well-known outlets and reputable suppliers. If you choose Internet shopping, the supplements may come from outside the EU and have different quality control standards. The full verdict isn't in yet, as is the case for most nutritional supplements, but many people see the value of taking glucosamine chondroitin supplements to relieve joint pain. As long as you consult your doctor first to make sure they are safe for you and your lifestyle and that they don't interfere with other health supplements or prescribed medication, it might be worth seeing if they have any effect.